On a cold and dark November weekend, the inside of the Hill Theater was filled with the soft green glow of a Costa Rican jungle. The stage was set for Greg Pierce’s Slowgirl. The production, performed Nov. 9-10, was the senior thesis of director Erica Christie ’19 and actors Meredith Rupp ’19 and Jacob Skolnik ’19. The play follows the development of the relationship between 17-year-old Becky (Rupp) and her reclusive Uncle Sterling (Skolnik) during Becky’s weeklong visit to his cabin in the Costa Rican jungle. Becky visits him faced with the blame of a horrific incident, where Mary Beth, Becky’s mentally handicapped classmate, was drunkenly cajoled into jumping out a window. Rupp and Skolnik navigated the delicate and layered complexities of their characters in thought-provoking ways. Rupp embraced the brash energy of a young person eager to radiate an easy sense of self-identity and worth. She embodied the ruthless popular girl sensibility in a way that brought audiences to become invested in her story, despite her character’s initially shallow and unlikable persona. Skolnik balanced Becky’s youthful intensity through a performance of lonely Sterling’s awkward but earnest attempts at connection. Christie explained how these conventionally unlikeable characters initially drew her to the piece. The design of the production was carefully planned in ways to support the world of the play. 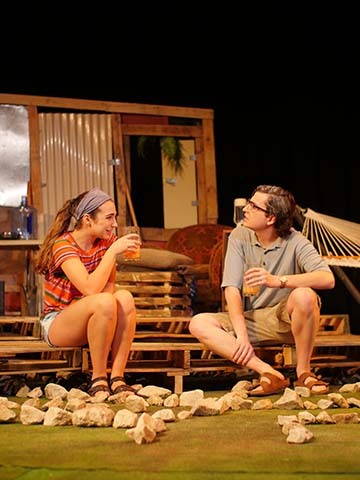 The set, designed by Emily Blanquera ’20, consisted of a frill-less living room, open and exposed to the surrounding jungle. For certain scenes, the room rolled back to uncover “the labyrinth,” Sterling’s meditative maze constructed of ankle-height stones. Christie explained how integral the design was in communicating the messages of the play. “For me, this is a show about two people who are hiding from each other.” This theme was heightened through the way the sound, for example, made it feel like the world was closing in on these two characters. The sense of claustrophobia, created through a thick, layered soundscape of jungle noises, forced the two to come out of hiding and communicate openly with each other. The atmosphere created through design, direction and performance enveloped the audience in the characters’ world until the very end. In the final moments of the play, as Becky and Sterling prepare to go into the labyrinth one last time, they shine flashlights into the audience. The light momentarily blinded the audience, but simultaneously made them visible to the characters, enforcing the sense of a shared reality.